This unusual tree can be found within the North-East corner of the former Victoria Park Racecourse fence near the Britannia Roundabout, approx 20 metres south-west of the outer Racecourse fence. Although not the oldest in South Australia, this is one of the finest and oldest example of the Dragon’s Blood Tree in Adelaide and one of only four known to the National Trust in the metropolitan area. It appears in the National Trust Register because of its ‘architectural’ form, and its rarity. It is an attractive tree, eventually of considerable age, and is an arresting sight in the Parklands. It is considered to be of regional importance. Its botanical name Dracaena draco derives from the Greek drakaina, meaning female dragon, and dracontos – dragon. It is currently placed in the Asparagus family. It is not a true tree, but a monocot with a tree-like growth. The Dragon tree, an evergreen, grows naturally in the Canary Islands, Cape Verde, Madeira, and Western Morocco. It was first recorded in 1640, and first appeared in Adelaide in the 1870s. Each branch grows for about 10–15 years and re-branches, resulting in an umbrella-like habit. It grows slowly, requiring about ten years to reach 1.2 metres in height but can grow much faster. It produces a first flower spike with white, lily-like perfumed flowers, followed by coral berries. When the bark or leaves are cut they secrete a reddish resin, one of several sources of substances known as dragon's blood, used in a number of traditional medicines with magical healing powers, and for wood staining, especially for the famous Stradivarius violin cases. It is expected to live to 365 years old, and will grow to a height of 12m to 18m. The height of this tree is 7 metres and its spread is 10 metres. It is used as an ornamental tree in parks and gardens, creating an ‘architectural’ appearance. 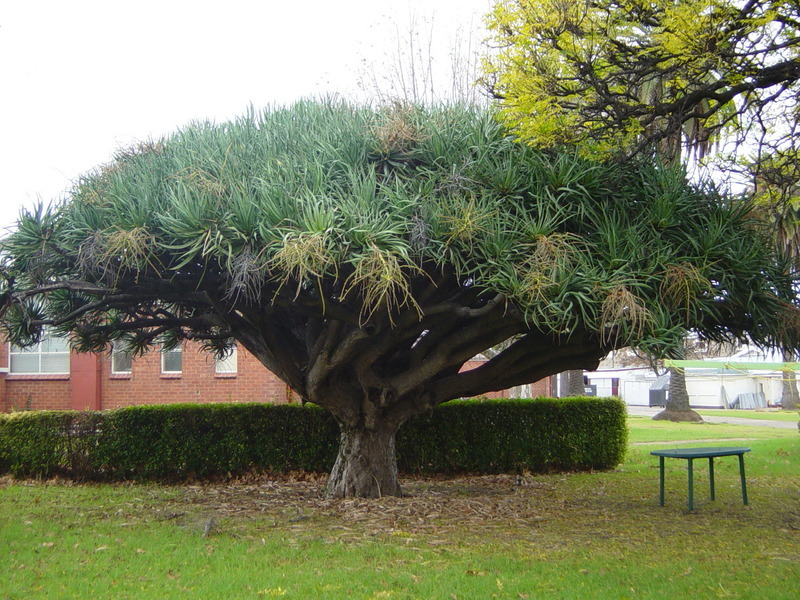 National Trust Significant Tree Team, “Victoria Park Racecourse: Dragon’s Blood Tree ,” Adelaide City Explorer, accessed April 24, 2019, https://adelaidecityexplorer.com.au/items/show/160.